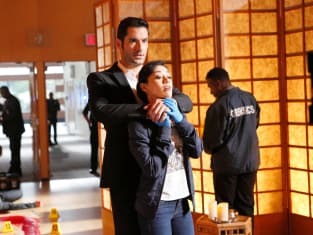 Chloe seemed to be a little jealous of Ella and Lucifer's relationship on Lucifer Season 2 Episode 8 while investigating a string of murders in a yoga shop. I don't know about you guys, but I think Chloe may have a crush on Lucifer. I'm not sure how I feel about it, but it seems like a natural thing to be happening. After all, they've worked together for a while now and shared much, so it seems inevitable that something like that would happen. It doesn't mean that a relationship will happen, but it looks like the door has opened in that regard. Lucifer certainly seems happy about it. My absolute favorite scene was when Chloe, Ella, and Lucifer were at the yoga shop and Ella was running through the scene describing what she thought happened. The look on Chloe's face when Ella got on her knees and made a stabbing motion towards Lucifer. Very cute, show. Very cute. And hilarious. I guess I was expecting more from the "nasty nerd" than her taking Lucifer to church as her part of the bargain for investigating the grave site. But, it fits in with what Ella's all about. And I actually kind of like that that's what she wanted. What she said to him was true, too. 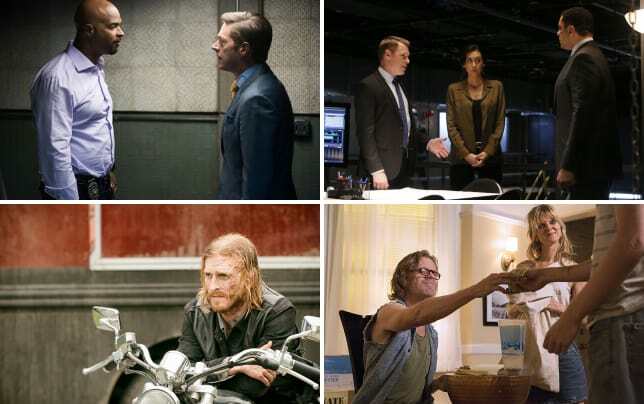 He is searching for something,and maybe Ella will be the one who brings Lucifer and his dad closer. It's an interesting concept, isn't it? I really wasn't into Ella all that much when she first started, but I'm really liking her role in the show now. She works a lot better when she's not so focused on the technical side of things...mostly because the procedural stuff is so boring. And while her God talk before was annoying, the way it worked this hour was great. It wasn't surprising that Charlotte was the one who released Azrael's blade. I've always thought since she came to L.A. that she's up to no good. It was obvious at the hour that that was indeed the case. I'm not buying her wanting to reunite with her family. I think she wants to start a war. She's already got Amenadiel on her side. Will she be able to get Lucifer? Somehow. I doubt it. Lucifer enjoys being on earth. He's got friends. He's accepted. He's enjoying his life here. Most importantly, though, he's got Chloe. As long as Chloe's around, he's not going anywhere. It's good to know that Maze still has Lucifer's back despite all they been through. I also like that we're getting to see more of Maze these days. The only thing we really missed this hour was Trixie. But, have you noticed? When there's no Trixie, we get more Ella. Someone here mentioned that once. Maybe Ella is the grown up version of Trixie? That may be...they sort of have the same personality...but Trixie is Trixie and she's irreplaceable. 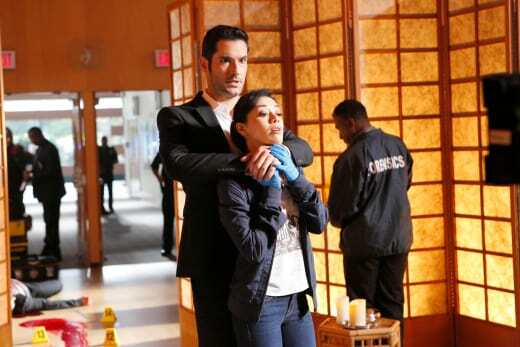 It was nice to see Dr. Linda finally calm down and work with Lucifer again. Though, it was hilarious how she asked about Hitler and what Lucifer did to him in Hell. If you think about it, it's definitely a realistic thing to want to know, right? She was distracted for a while, but when she finally realized she could analyze him just like she did any of her other patients (just like she did before he showed her who he really is), it was a turning point for her. Lucifer may be different, but he's similar to us in many ways. And I like that Lucifer feels he can be himself in front of her. Not his true face, but who he really wants to be, which is part of normal society. Hopefully Amenadiel and Charlotte won't ruin it for him, but it doesn't seem they're going to let Lucifer live peacefully here on earth. What did you think of "Trip to Stabby Town"? Hit the comments and share your thoughts. If you missed anything, you can watch Lucifer online right here via TV Fanatic!